Children have such creative imaginations that it is often hard to shut them down prior to going to bed. Their minds just keep getting busier and busier. Spinning off of each child’s individual activity, Susan Pace-Koch writes about the adventures the child is having while getting ready for bed. From a cute blond little boy with a ranch themed pillowcase, daydreaming about horses and cows, to a sweet little girl making a cave with her bed sheets daydreaming of the sites she sees. Each child and their dream can be seen on the cover, the simplicity of what they are doing that causes their minds to be so imaginative. My children just loved switching between each child’s story to finding them on the cover page in a hide and go seek fashion. I love the short, descriptive words on each page, flowing at angles so playful! The color theme of each story plays into the different vignettes that each child is imagining, making each unique and beautiful. A child could easily relate to these scenes as he/she settles in for the night. I loved the arrangement of color and text that went along so well with the illustrations. Great inclusion of an array of different children to appeal to all races and nationalities. Imagination knows no bounds. Susan was born in Alaska, raised in Washington and now resides in California. A trip to the Grand Canyon gave her an idea that she 'couldn't get out of her head'. 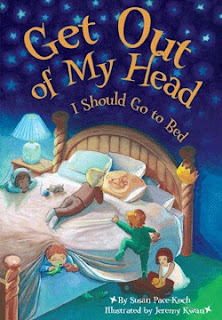 This Get Out Book is the first in a series of delightful books that take children outside and out of their normal realm. Jeremy is a native Californian. He chose an art career early in life and is able to do what he does best! A drawing becomes finished art and he makes the pages come to life! The characters jump out of his mind and right onto the pages! The medium he chose for the "Get Out Of My Head" was gouache. Excited to see more children’s books from Get Out Books in the Get Out series!